Like, back in 2008, when Iron Man came out, I really had no interest in seeing it. I thought that The Dark Knight was going to be pretty iffy just because it is based on some superheroes journey. But then I started this really random obsession with Robert Downey Jr. (you gotta admit, he is kinda hot...and super talented), so I really had to watch Iron Man. This movie, while not as good as the Batman movies, is one of the most enjoyable superhero action films ever. 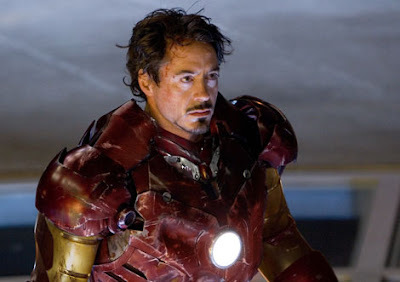 Tony Stark (Robert Downey Jr.) is a billionaire head of a weapons manafacturer who was captured in enemy terroitory, with what seems as no way of getting out. But thanks to his genius ideas, he builds a suit of armour to escape-and succeeds. Stark realises that he is on to something, and he modifies that suit to make himself 'Iron Man', becoming a reluctant hero along the way. The heart of this movie really is Robert Downey Jr., who is fantastic as Tony Stark, using complete arrogance to make the character particularly unlikeable...but we all just end up liking him in the end. This doesn't come across as the average action film. Sure, it has a lot of bombs and sweat, but the way it is done is entertaining while being somewhat intelligent. This film has a great ensemble cast too. Gwyneth Paltrow is pretty sweet as the kind hearted secretary Pepper Potts. Terrence Howard and Jeff Bridges also provide great support also. If you are looking for a hard out action film, with plenty of attitude, the go no further than Iron Man. And don't leave it to the last minute, like I did earlier this year. Seriously, if you haven't seen it and you are reading this, GO GET IT OUT! Trust me, you won't be disappointed. I am so excited to see the sequel in a couple of months (cheapo...waiting for the DVD to come out).